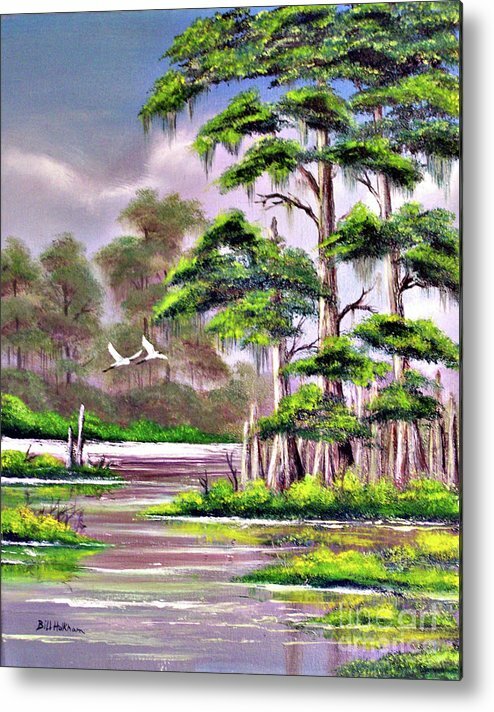 Cypress Trees-wakulla River Florida by Bill Holkham - 6.375" x 8.000"
Cypress Trees-wakulla River Florida metal print by Bill Holkham. Bring your artwork to life with the stylish lines and added depth of a metal print. Your image gets printed directly onto a sheet of 1/16" thick aluminum. The aluminum sheet is offset from the wall by a 3/4" thick wooden frame which is attached to the back. The high gloss of the aluminum sheet complements the rich colors of any image to produce stunning results. 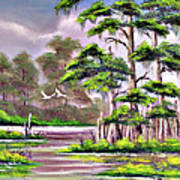 Bill, Congratulations for your feature in our group, Florida-Images of the Sunshine State! Dramatic and beautiful. Love it! A scene along the famous Wakulla River in Florida where the wildlife is abundant. 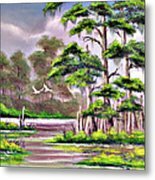 Snowy Egrets take flight amongst the Cypress Trees with dazzling lights upon the river and the everpresent luscious greenery. Bill has been painting and selling his artworks and prints for over 30 years and they are collected worldwide. You will see a wide variety of subjects and many locations around the world when looking through his galleries on this site many of which have been inspired by his travels. 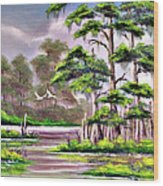 There are also a wide variety of products available in addition to the prints and therefore the painting that you like can be seen on many items. Hopefully you will enjoy looking through Bill’s artworks and since he is painting full time please visit his site regularly to see the latest additions.